We periodically hold Information Briefings for our clients, prospective clients and business associates. We select the content to provide an opportunity for attendees to receive balanced information about technology related topics that are important to their businesses. These educational briefings are designed for business owners, executives and managers and are not a sales presentation. While there is a little bit of technical information weaved into the discussions, the presentations are held at a higher business level – specifically for business owners and managers. The following is a listing of some of our past events. It is predicted that cybercrime will cost the world $6 trillion annually by 2021, up from $3 trillion in 2015. This represents the greatest transfer of economic wealth in history. This dramatic rise (in damage costs) only reinforces the sharp increase in the number of organizations unprepared for a cyber attack. As the “Bad Guys” get better at what they do, a focused effort must be made to keep your data safe. Because security and cybercrime are definitely issues you want to pay attention to BEFORE you are a victim, Wolf Consulting is holding a free Informational Briefing. The following is a listing of our upcoming events. 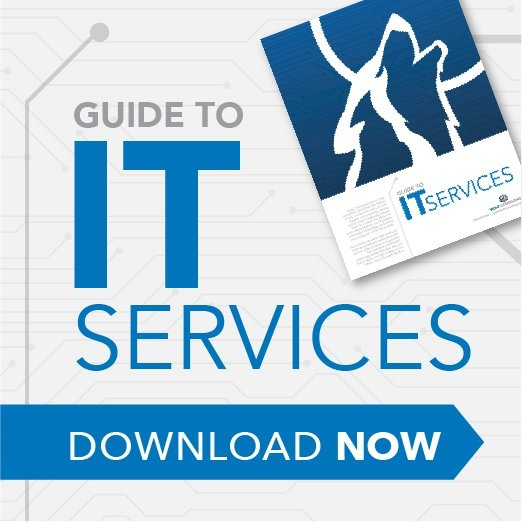 FREE Informational Briefing: Does Your Business Really Need a Server? In today’s ever-changing IT world, more and more business owners are asking: Do I really need a server or how can I better utilize the cloud? As internet access speeds are becoming faster and less expensive, the reality of moving your servers, applications and/or data to the cloud seems reasonable. Some business owners feel moving to the cloud is a necessity, while others like the physical security of having an on-premises server. In reality, most companies have a hybrid approach in which some services and applications are cloud hosted and others are not. So, how do you determine the best answer for your company? Wolf Consulting is holding a free Informational Briefing where you’ll learn about the differences so you are better able to make the right business decisions for your company. The days of cyber criminals sending emails with bad grammar and spelling have passed. Today’s fraudulent emails use well designed and authentic looking communications that are often too difficult to resist. Cyber criminals are also using sophisticated techniques to embed damaging programs on legitimate web sites. The threat is real and cybercrime CAN happen to you and your company. Because security and cybercrime are definitely issues you want to pay attention to BEFORE you are a victim, Wolf Consulting is holding a free Informational Briefing where you’ll learn about the latest threats and steps every owner and manager should know to protect their company. “The Cloud” has become a major buzzword in business for very good reason. Small, medium, and large enterprises alike are taking advantage of cloud computing to build or expand their IT infrastructure, simplify the upkeep of software applications, accelerate collaboration between employees and with people outside the company, store computer backups for disaster recovery purposes, and shift IT costs from capital budgets to operating budgets. The questions are, which cloud services make sense for your company, which are fully mature and which are still more hype than reality? Is the Cloud always better than on-premise? Where is the best bang for the buck? The Health Information Technology for Economic and Clinical Health (HITECH) Act, enacted as part of the American Recovery and Reinvestment Act of 2009, was signed into law in 2009, to promote the adoption and meaningful use of health information technology. Subtitle D of the HITECH Act addresses the privacy and security concerns associated with the electronic transmission of health information, in part, through several provisions that strengthen the civil and criminal enforcement of the HIPAA rules. Nearly every small and mid-sized business (SMB) has opportunities to increase productivity by implementing Remote Access. From remote offices, to travelling outside sales people, to telecommuters, to workaholics who love to work extra hours, there are ways to securely provide Remote Access to your corporate software and data. There are many different technologies and solutions under the Remote Access umbrella. The right solution for an organization depends on many factors. Because it’s important to understand the different solutions, and which solutions are the best for improving productivity in each of the various situations, Wolf Consulting is holding a free Informational Briefing. In this briefing, you’ll learn important Remote Access information every owner and manager should know for their business. FREE Informational Briefing: Disaster Recovery and Business Continuity – You Need More than Just Backups! Nearly every small and mid-sized business (SMB) has critical data, information, and systems it couldn’t do without. From email servers, to customer databases, to critical data files — losing any of them for very long would be disastrous for the bottom line… and possibly even put them out of business. There are often BIG differences between what business owners and managers “think” they have regarding backups, disaster recovery and business continuity compared to what they actually have. Because backups, recovery and business continuity are definitely issues you want to pay attention to BEFORE you need them, Wolf Consulting is holding a free Informational Briefing where you’ll learn important information every owner and manager should know for their business. Over the past few years, cyber criminals have moved their sights from large enterprises to instead focusing on SMBs (both for-profit business as well as non-profit organizations) to steal their data files and steal their money. Yes, it really CAN happen to you and your company. There are often BIG differences between what business owners and managers “think” their risks are compared to what they actually are. Because security and cybercrime are definitely issues you want to pay attention to BEFORE you are a victim, Wolf Consulting is holding a free Informational Briefing where you’ll learn about six critical security and cybercrime threats every owner and manager should know for protecting their company. There are often BIG differences between what business owners and managers “think” they have regarding backup and recovery compared to what they actually have. Because backup and disaster recovery is definitely an issue you want to pay attention to BEFORE you need it, Wolf Consulting is holding a free Informational Briefing where you’ll learn six critical questions every owner and manager should know the answer to for their business. Windows 8 and Office 2013 are generating lot of buzz. When meeting with clients and prospective clients, we’ve been hearing a fair amount of questions about the new Windows 8 and the new Office 2013. The questions typically focus on what these technologies mean for their business. What the Heck is this “Cloud Computing” Thing? “The Cloud” is generating a lot of buzz. When meeting with clients and prospective clients, we’ve been hearing a fair amount of questions about “the cloud.” Sometimes someone heard about Hosted Exchange Email, Hosted SharePoint, Cloud Backups, Hosted Applications or Hosted Servers. Or they’ve heard words like Public Cloud, Private Cloud, Hybrid Cloud, Software as a Service (Saas) or Infrastructure as a Service (IaaS). We find that many people are hearing and talking about “the Cloud”, but often they aren’t really sure what it is, or how they could leverage “the Cloud” for their business.